shells can be observed where the rivers flow into the sea, because in these places the water is not very salty on account of the fresh water which it has mingled with; and the sign of this can be seen where in ancient times the rivers of the Apennine mountains flowed into the Adriano sea, and most of which show between the mountains a great number of shells as well as the bluish soil of the sea and all the stones which are quarried from that place, are full of shells.) �Come le radice settantrionali di qualunche alpe non sono ancora petrificate; e questo si vede manifesta mente dove i fiumi, che le tagliano, corrano inverso settantrione, li quali taglian nell�altezze de� monti le falde delle pietre vive; e, nel congiugniersi colle pianure, le predette falde son tutte di terra da fare boccali, come si dimostra, in Val di Lamona, fare al fiume Lamona (q) nell�uscire del Monte Appennino, far l� le predette cose nelle sue rive�. Sheet 10 r. (In the way that the northern foot of some of the Alps are not yet petrified; and this can be clearly seen where the rivers which cut through them , run in the opposite direction to the north, cutting heightwise the strata of raw rock; and, in joining the plains, the aforesaid strata are all of terra cotta for making mugs, as can be seen in Val di Lamona, on the banks of the river Lamona (q) once outside the Apennine mountain). The river Lamone passes near Faenza, between Castelbolognese and Forl�, where we know, from a note of the Leicester manuscript, ms. L., Sheet 88 v. that Leonardo had to follow the movements of the Romagna expedition, probably reaching as far as Bologna. Of his residence in Bologna echo may be found in an interesting comment contained in the Leicester manuscript: �Se si volter� il fiume alla rottura del terremoto, il fiume (ma) non correr� pi� inanti, ma ritorner� nel corpo della terra, come fa l�Eufrates fiume; e cos� faccia a chi a Bolognia rincresce li sua fiumi!�. Sheet 28 r. �If the river should turn about at the onset of the earthquake, the river (but) will no longer flow forwards, but will return into the entrails of the earth, as the Euphrates river does; and so should it do to those in Bologna who disparage their river!) Said perhaps in relation to fears, already at that time quite real, regarding floods and changes in the course of the Reno; an old question (on which Leonardo�s opinion may have been requested), which having been protracted in a sterile manner on account of the disputes of the Bolognesi and Ferraresi, was more topical than ever towards the mid-XVII century, Cf., for the history of this matter, the long series of entries and reports regarding the regulation of water in the three provinces of Bologna, Ferrara and Romagna in Raccolta d�autori che trattano del moto dell�acque. (second edition. Florence, in the printing-works of His Royal Highness. Volume IV (1768), pg. 303-530, and charts). almost justifying Leonardo�s drastic augury Even Leonardo�s suggestions on how to empty a pond running into the sea, Sheet 2 v.; 17 r.; cf. Atlantic Codex, 139 r.-c. and his very precise observations on the wave motion of the sea Cf. the Leicester manuscript on sheet 26 v., and elsewhere in various places. seem to date back to the same period here recalled, if one includes, as well as Leonardo�s activities on the shores of the Adriatic, also his previous residence in Piombino, Cf. L manuscript, sheet 6 v. then associated with the transfers of the army in the service of which he found himself. Finally, seeing in the very rapid review of the topics to be dealt with in the Treatise on water, mention of the following passage: �Della musica dell�acqua cadente nel suo vaso�, 27 r. cf. also the list on sheet 74 v.-b of the Atlantic Codex. (of the music of water falling into a vessel) we recall that fragment of the small book of notes L (used by Vinci during his trip in Romagna): �Fassi un�armonia colle diverse cadute d�acqua, come vedesti alla fonte di Rimini, come vedesti add� 8 d�agosto 1502�, (A musical harmony is made with the various water falls, as I saw in the fountain in Rimini, as I saw on the day of 8 August 1502) L manuscript, sheet 78 r. which show us Leonardo pause, alert to the call of nature, at the same time as he suffered the covetous and sluggish designs of the men of his time, the evil nature of which he was to have acquired bitter experience of for ever. Cf. sheet 22 v. see too Dell�Anatomia, sheet A, transcribed by G. Piumati, Paris, Rouveyre, 1898, sheet 2 r., pg. 65-66. 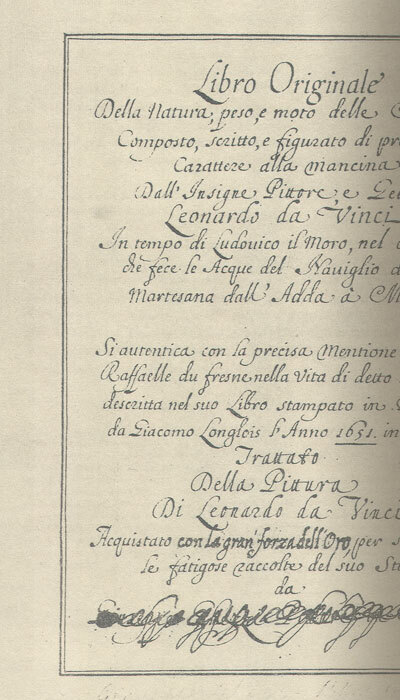 A last reference remains to be made with regard to Romagna, in the name of Andrea da Imola (sheet 1 v.); but it would be very difficult to say if Leonardo was aware of the opinions of the person mentioned, whom Solmi (Le fonti dei manoscritti di Leonardo da Vinci, Turin, Loescher, 1908, pg. 61) deems should be identified as Andrea Mainarmi da Imola, directly or indirectly; and, if directly, in Romagna.